As is well-known, the assessment of tax and transfer systems draws mainly on two fundamental principles: efficiency and equity. The former relates to the presence of distortions in the economic behavior of agents, while the latter focuses on distributive justice. 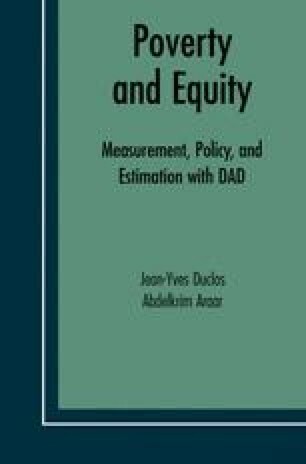 Vertical equity as a principle of distributive justice is rarely questioned as such, although the extent to which it must be precisely weighted against efficiency is a matter of intense disagreement among policy analysts. A principle of redistributive justice which gathers even greater support is that of horizontal equity, the equal treatment of equals. The HE principle is often seen as a consequence of the fundamental moral principle of the equal worth of human beings, and as a corollary of the equal sacrifice theories of taxation. This chapter and the next cover in turn the measurement of each of these principles.